The Octavia RS wagon holds a special place in my heart. I owned a Mk1 RS for twelve years, I loved that car. Skoda recently brought out a facelifted version of the Mk3 model, and I was keen to see what my old car had evolved into. 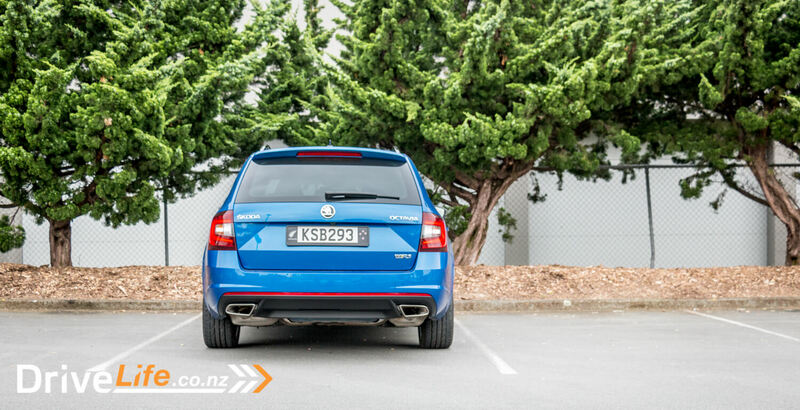 There are several options in the Octavia RS range, starting with what Skoda refer to as the sedan, which is actually a hatchback. 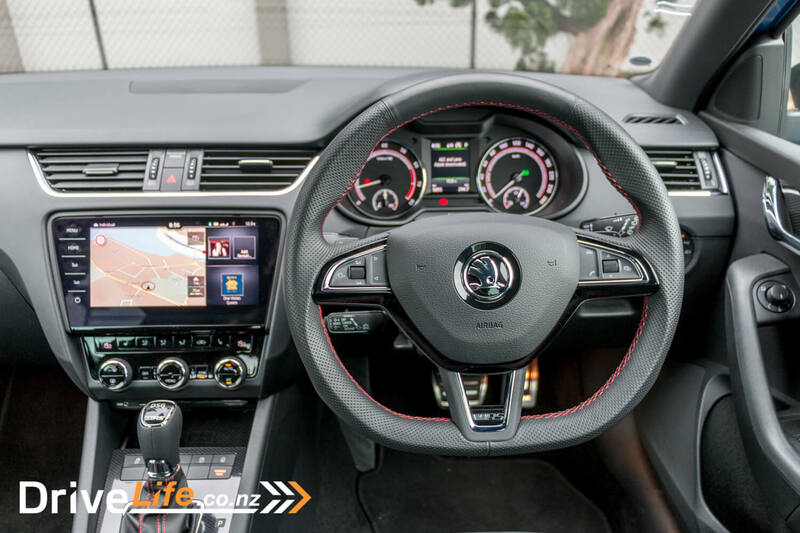 The 169kW/350Nm petrol 6-speed manual sedan is $48,990, with the manual wagon being $1000 more. 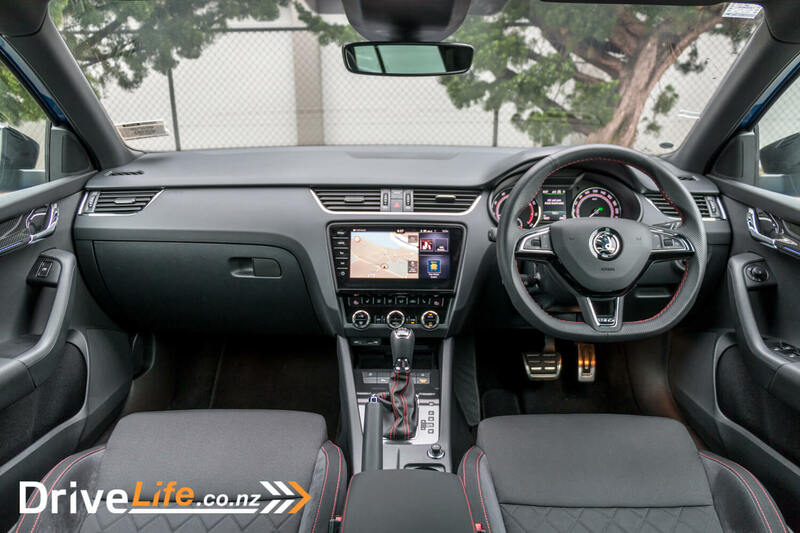 Then the 6-speed DSG (dual clutch automatic) petrol sedan and wagon are both $52,890. Finally the 6-speed DSG 4×4 turbo-diesel, with 135kW/380Nm is $54,890 in sedan or wagon form. 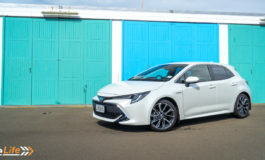 Standard spec includes ABS, stability control, hill hold control, front curtain and side airbags, driver’s knee airbag, auto lights and mirrors, auto dimming mirror, keyless entry and start, autonomous emergency braking, radar cruise, lane assist, blind spot detection, reversing camera and sensors all round, LED lights all round, gloss black details, tinted rear windows, dual zone aircon, drive modes, footwell and ambient lights, motorised tailgate, sport seats, satnav. 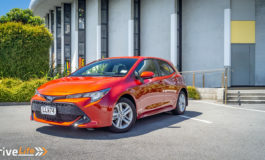 There are eleven colours available, seven of which are whites, silvers, greys and blacks, then there’s the impressively bright Rallye Green Metallic, Corrida Red, the bronzey Rio Red Metallic, and the colour tested – Race Blue. 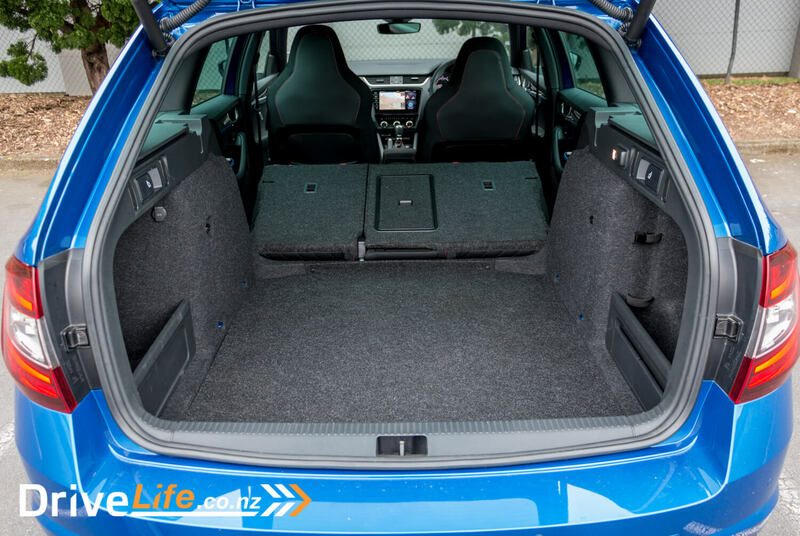 If you want to customise your RS you have quite a few options, including park assist auto parking ($1000), panoramic glass roof ($2500), DCC adaptive dampers ($2500), leather seats ($2500), Canton sound system ($1000), 19” wheels ($1500). If you go crazy ticking those boxes you can get your Octavia up to over $70k. The Mk3 Octavia was a handsome looking car, and when I saw the first photos of the facelift with its split headlights I was concerned they’d spoiled its looks. But when I saw this Race Blue example in the metal I was pleasantly surprised. It looks way better than I thought, and still retains that handsome front. Overall, it’s a good looking car, with echoes of the previous Octavia combined with the sharp angles and creases of Skoda’s current design language. I love the twin exhaust outlets on the rear, and the RS bumpers give it a purposeful look. The gloss black mirror caps and grill suit it too – I’m not a fan of too much chrome. 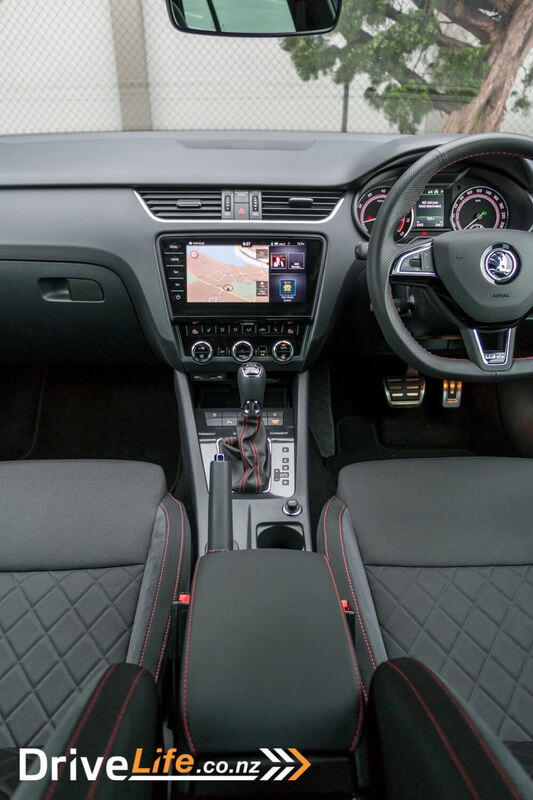 The inside of the Octavia RS is rather nice, and a huge step up from the one I used to have, with a much more classy feel. It’s very similar to the current VW range and borrows quite a few components from VAG’s more expensive cars. The dash, carpets and headlining are all dark grey but there are chrome highlights here and there to lift things a little, plus strips of carbon-fibre-ish stuff in the doors. 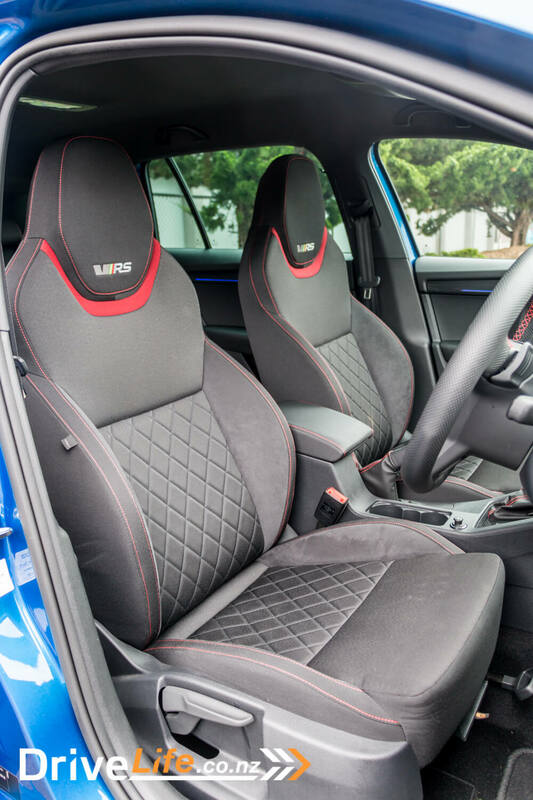 The seats are a mix of cloth and alcantara suede, with red stitching and highlights, and RS logos stitched into the top. They look great, and are very comfortable. They’re adjustable in all the usual directions and the steering wheel adjusts for height and reach, so a good driving position is easy to find. Electrically adjustable memory seats are available as a cost option. The front seats are heated, as is the steering wheel, and the car can be set up so the steering wheel heats when the driver’s seat heater is turned on. The flat-bottomed steering wheel is nicely shaped and great to hold and is trimmed in perforated leather. There are thumb controls for trip computer, phone and stereo. 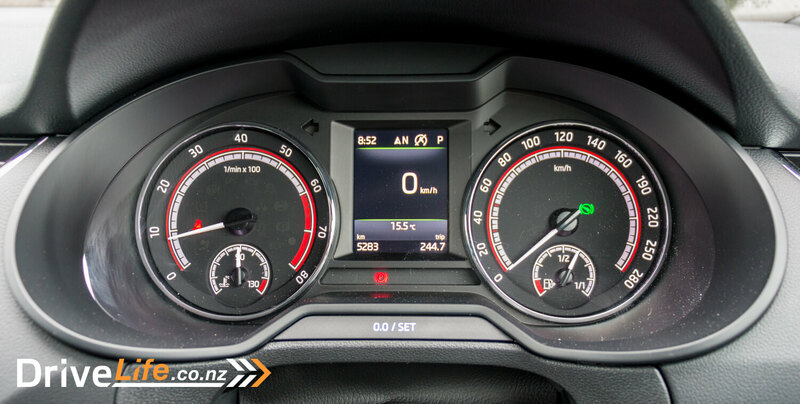 The instrument cluster consists of two main gauges for speedo and rev counter with a large colour central screen for trip computer. 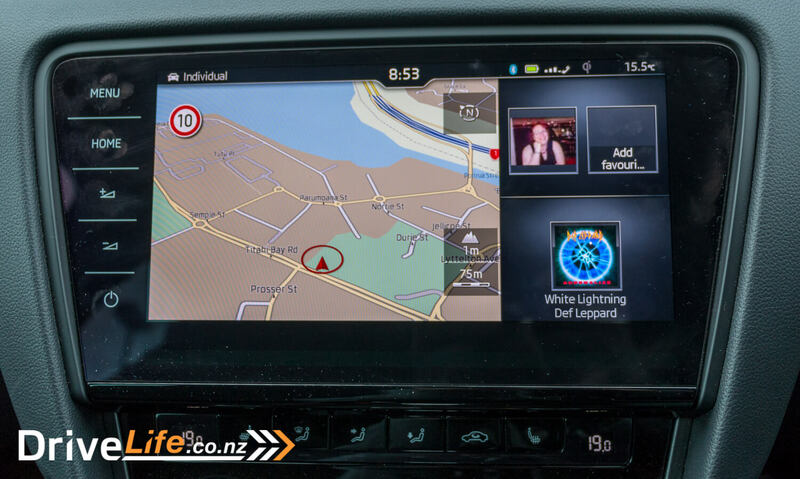 This can be set to quite a variety of displays including digital speedo, satnav directions, music track etc. The dials are lit in white and are very clear and easy to read. 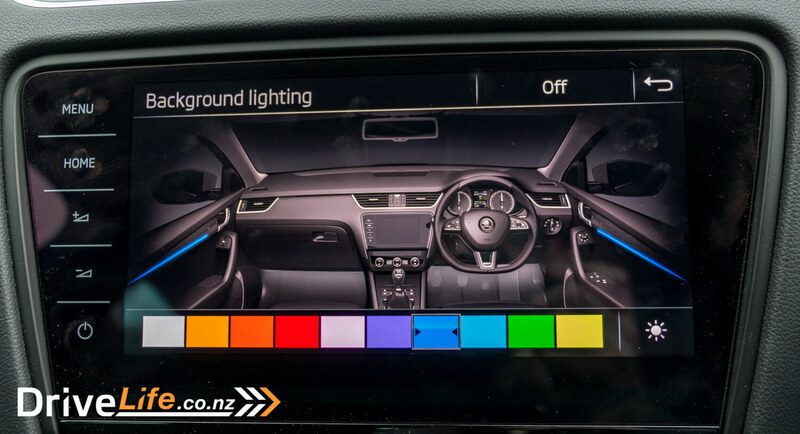 There are ambient lighting strips in the doors which can be set to any one of ten colours depending on your mood. These look great at night, as does the footwell lighting in the front and rear. These things really lift the interior to give it a more premium feel. The large, clear central screen will look very familiar if you’ve been in any recent VAG group car. It’s clear and easy to read, and the interface is well designed and easy to get around. Screens can be switched with a left or right swipe, like a phone, and on-screen buttons are large and easy to find. There’s a clever proximity sensor which makes the buttons at the bottom grow larger as your hand gets near the screen. I like this. There’s a new Home button which splits the screen into three panels – a large map, phone settings and media. Phone favourites can be added for one-touch dialling. 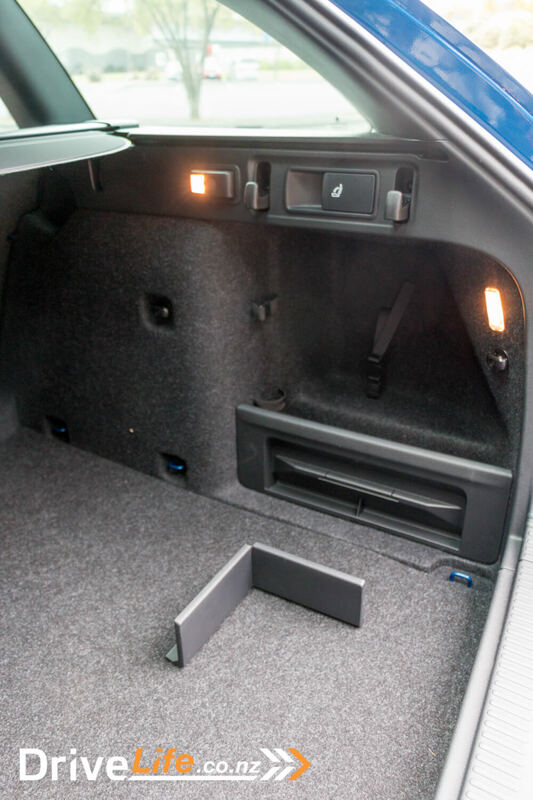 Under the centre console there’s a flat cubby for your phone with an inductive wireless charger included as standard. 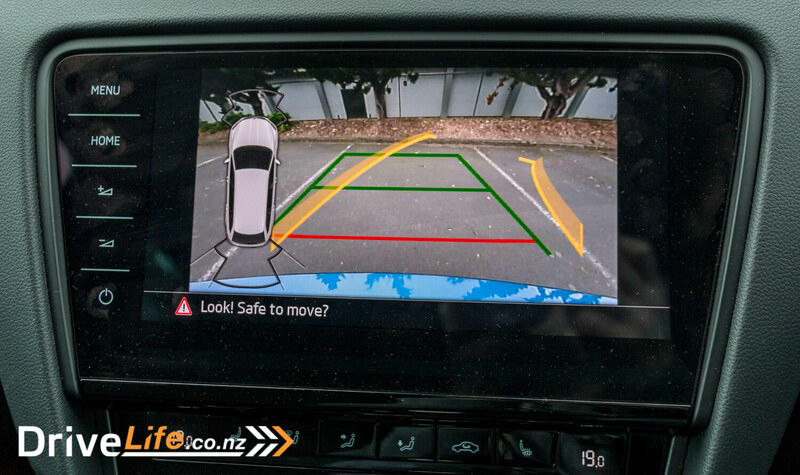 The 3D satnav display is very clear, with 3D buildings and landmarks when you’re in town. It shows the current speed limit in the top corner too, which is useful. 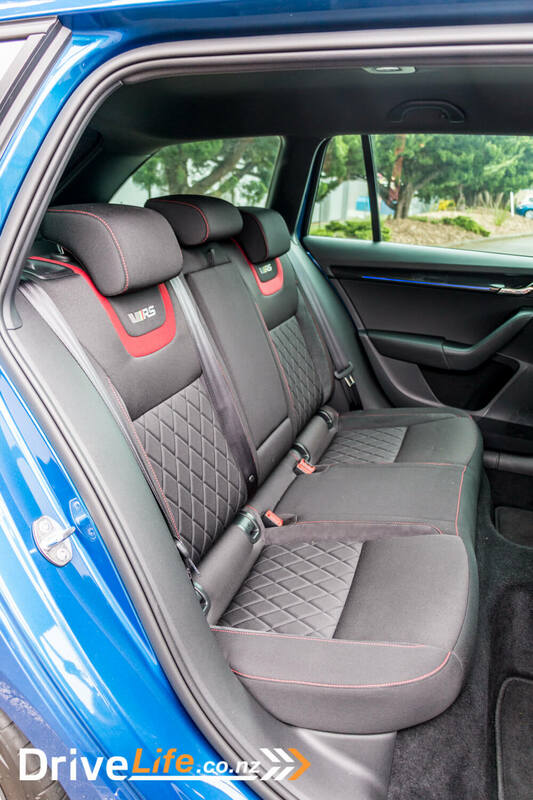 The rear seats look great and are as comfy as the fronts, with a decent amount of leg room. They’re 60/40 split with a ski hatch in the middle if you just have long things to carry. 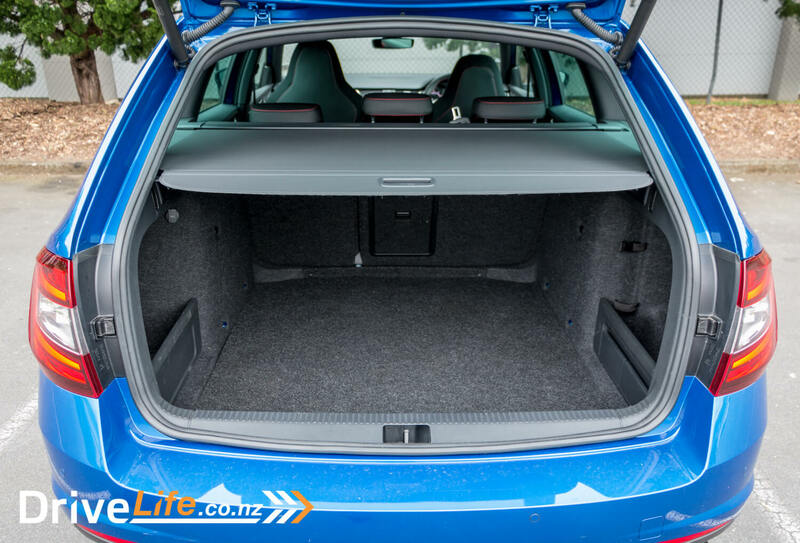 Opening the motorised tailgate reveals the cavernous boot that the Octavia has always been famed for; 610 litres to be exact, and it features some of Skoda’s “Simply Clever” features, such as a light that pops out to become an LED torch, plenty of bag hooks and movable plastic velcro dividers to stop boxes sliding around. Other nice Skoda features around the car include an ice scraper inside the filler cap, a handy insert for the cup holder with pockets for the key and a phone, and parking ticket clip on the windscreen. I was a bit disappointed that it didn’t have umbrellas in the doors like the Superb. 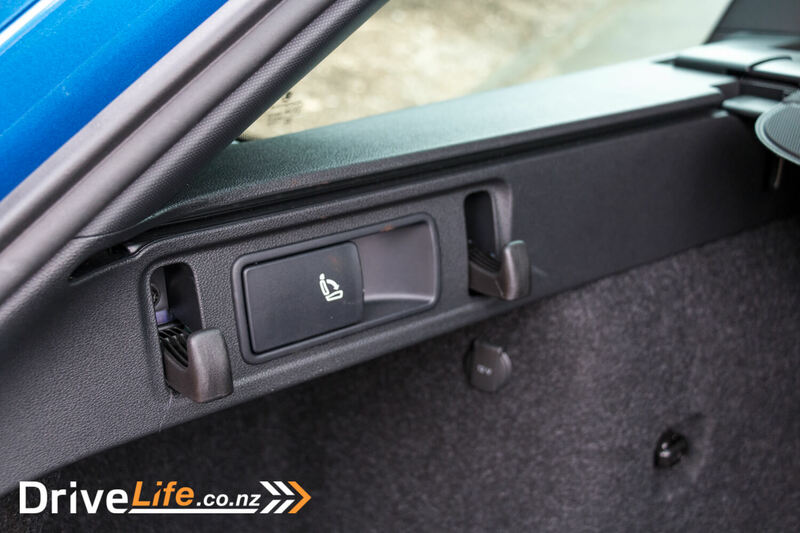 The Octavia RS has keyless entry and start, just touch the handle to unlock, then hop in. Pairing my phone via Bluetooth went without a hitch. New drivers can set up a profile, linked to the key, which will remember their phone settings, favourites, radio stations etc. The 8-speaker stereo is good, nice and clear and definitely loud enough! It also has an internal hard drive that can be loaded up with music if desired. In traffic, the Octavia RS feels comfortable, with good visibility, plus blind spot warning lights in the mirrors to help you out. There’s radar cruise control included, set with a slightly awkwardly placed stalk which stays at about 7 O’clock on the steering wheel. It soon becomes easy to use but I prefer buttons on the wheel to an extra stalk. The radar cruise works well all the way to a stop but has a curious feature where it disables itself after a few seconds at a standstill, lighting up the display with the words “Apply brake”. It can be re-engaged with a pull of the stalk but why not just let the car sit still with the brakes on until you’re ready tell it to go, like most other systems? 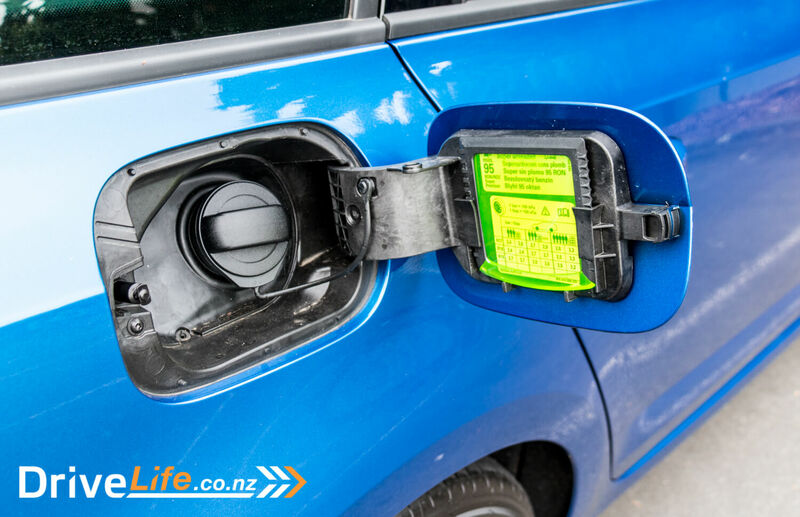 It may be to encourage you to use the engine stop/start function, which engages when you’re applying pressure to the brake pedal at a standstill to save fuel. This is a clever feature but it’s a bit enthusiastic, cutting the power when you haven’t quite stopped. I’ve experienced this in VWs as well as other Skodas so it’s not unique to this model. On the open road there was a chance to test the Octavia’s drive modes. 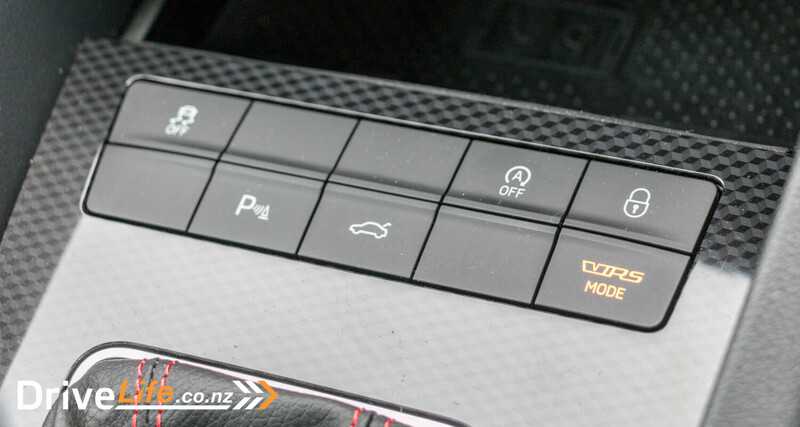 There’s Eco, Normal, Sport and Individual, activated by pressing the vRS button. As you’d expect each one changes the characteristics of the car, with Eco giving you a squashy-feeling pedal and staying in higher gears for longer, Normal giving quicker response and more dynamic driving feel, and Sport giving the quickest throttle feel, holding onto gears longer and making a much more growly engine note – which is generated through the speakers. 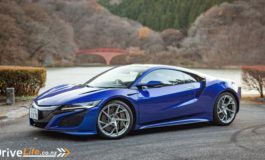 “Oh no” you might be thinking, “fake engine noises” but wait, this actually sounds good and adds a much more sporty feel to the car without a loud exhaust to annoy other road users. Unless you’re having a back road blast, Sport mode tends to hold the lower gears a little too long for my liking, I found Normal to be better, but I liked the growly noises, so I set an Individual mode setting to make sporty noises in Normal mode. On a twisty road, the Octavia RS is satisfying to chuck around the corners, with good road holding and steering feel. The brakes are excellent with a firm feel, giving you the confidence that the car will stop quickly if you need it to. 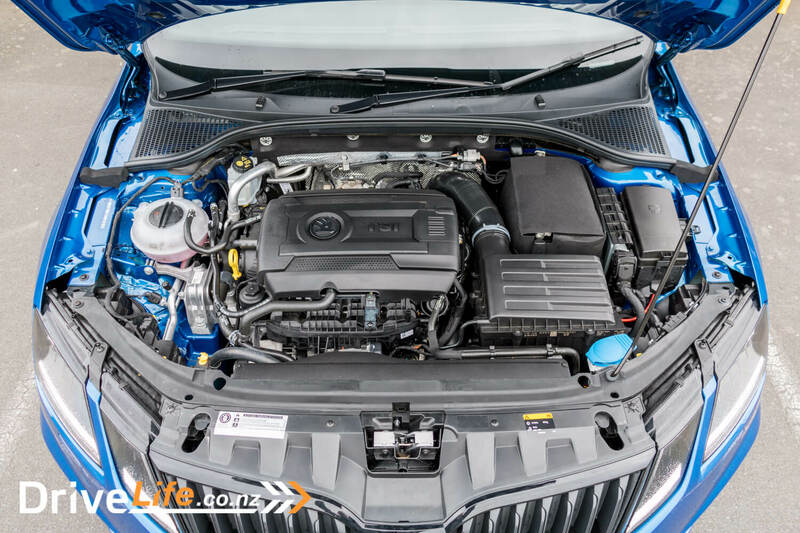 The Octavia RS has a standard Electronically locking front differential, which helps it to put down the power through the front wheels, and gives better grip and feel coming out of corners. Performance is decent, with a 7 second 0-100 time and good in-gear acceleration. Overall it’s a good car to drive and has that a GT feel to it. It’s a car that you could comfortably drive all day, but also have some fun with if the opportunity arose. I loved the Octavia RS I used to own, and I think if I bought one of these I’d love it just as much. It still ticks all the right boxes for me. It looks good, it’s quick, fun to drive, has loads of space and equipment. It’s comfortable enough to drive long distances but can still handle a fun back road if you need it to. And unlike the one I had, the front doesn’t scrape on every other car park ramp. 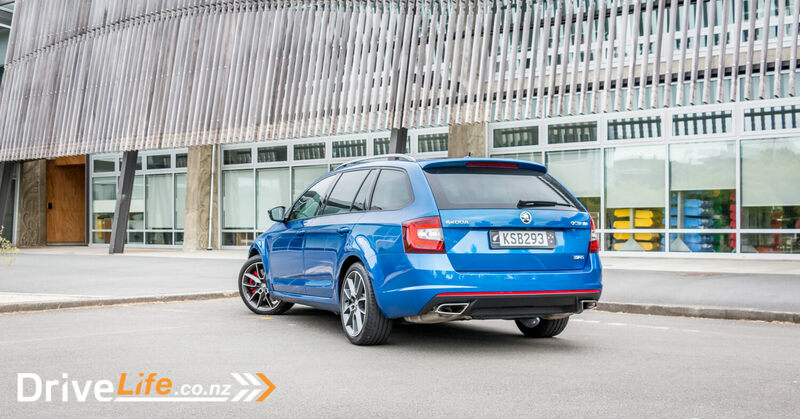 For those of us who are not looking for an SUV for the family car, the Octavia RS is an excellent choice. It’s close to a five chevron car for me but not quite. If Skoda threw in a couple of the optional extras at this price it just might earn it that extra half!